The Stainless Steel Super Grill is the portable grill that loves to come indoors and bring fresh grilled flavors to your table, no matter what the weather is outside. Every season is grilling season when you have the indoor countertop Stainless Steel Super Grill! Don’t wait for warm weather to enjoy juicy burgers, savory kabobs or fresh grilled salmon. Plus, interchangeable non-stick plates make this the portable grill that’s also a griddle, panini maker and waffle chef. Just swap the plates to perfectly cook the fresh tastes you crave at a moments notice. This counter top grill can be your favorite kitchen appliance, all year round. 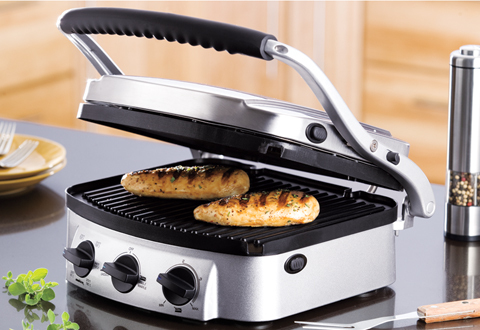 Enjoy the flavors - and enticing aromas - of steak, chicken and even marinated vegetables when using the counter top grill. (Hinged cover adjusts to even the thickest cut of steak.) Then, switch out the non-stick plates to whip up waffles, panini sandwiches or omelets. This 4 in 1 stainless steel grill does it all - beautifully! 6 temperature controls. Stay-cool handle. Drip trays and scraper included. The Stainless Steel Super Grill will be your favorite new appliance! It’s the counter top grill that brings the taste of summer to your kitchen, all year long. 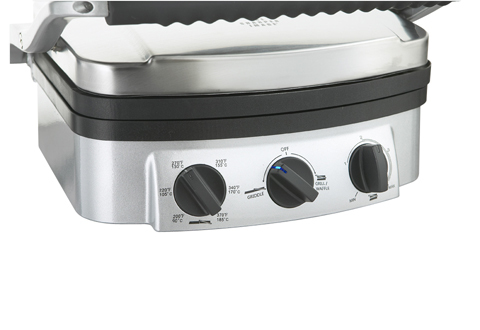 This stainless steel grill comes with an interchangeable non-stick griddle and waffle plates. 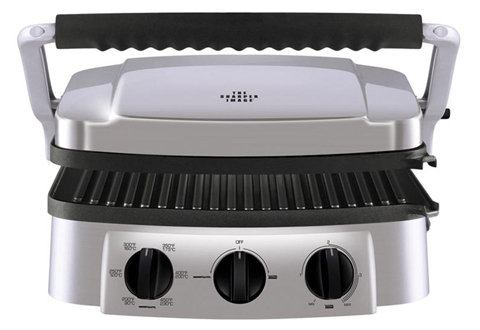 Cook your favorite steaks, kabobs, waffles and panini sandwiches all on one great portable grill: the Stainless Steel Super Grill with stay-cool handle. Thick steaks and sandwiches? Not a problem for this super versatile counter top grill. The hinge adjusts for all your foods, giving you maximum cooking area. For easy clean up, use the scraper (included) and swap out the disposable drip trays. Forget cooking on a big expensive grill, this can-do stainless steel grill boasts 6 adjustable temperature controls, giving you a range of 200-400 degrees to work with. You can whip up pancakes and eggs, or steak and sandwiches - all with this fabulous indoor, portable grill. Your must-have versatile kitchen appliance is the stainless steel grill that cooks right on your counter, giving you great grilled flavors in every season. Don’t wait for warmer weather; bring the warmth indoors with the versatile, flavorful portable grill.